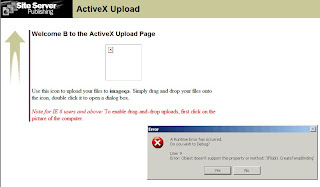 Cause: Registry key disables ActiveX Utility. Cause: The browser has not read the META tag (POSTINFO) information. Note: if it is not in /scripts, you may need to change the directory reference to where postinfo.asp lives. Cause: Your browser does not have a reference to postinfo.asp. Error: The Web server returned the following error: You do not have write access to destination URL "http://destinationURL"
Cause: The destination virtual directory (ie, the directory on the web server where you want to upload the file to) does not have the appropriate write permissions in IIS. Resolution: Check the IIS MMC for IIS write permissions. Error: The Web server either is not responding or returned an unrecognized response. Cause: The Execute Permissions setting of the Scripts virtual directory in IIS is not set to Scripts and Executables. Resolution: In the IIS MMC, set the Execute Permissions of the Scripts virtual directory to Scripts and Executables. Error: The Web server returned the following error: Cannot move file "somefile.extension" to its final destination. Further processing is stopped. Cause: NT permissions are denying write access to the file. Resolution: Logon to the server and change the file or directory permissions to allow write access to the file. Cause: The read-only attribute of the file is set. Resolution: In Windows Explorer, right-click on the file or directory and deselect the read-only property. Cause: A personal firewall, Symantec firewall or other Firewall client interferes with the functioning of the Site Server upload utility. Resolution: Disable any and all software firewalls. installing PHP - the easy way!